It is said that you don't choose your team—your team chooses you. On April 5, 1975 Manchester United Football Club chooses a young football fanatic growing up on England's North West coast. On this day Gary B. France becomes "United. "Twenty years later, Gary relocates to the United States—destination Detroit. Blue collar. Motor City. Hockeytown. Where football means Detroit Lions—and soccer is virtually nonexistent.Embarking on a journey thousands of miles from home, Gary is determined to reconnect with the team and the game he left behind. Before long, he is thrust into an early morning underground subculture of soccer fanatics.Could America be waking up to soccer? 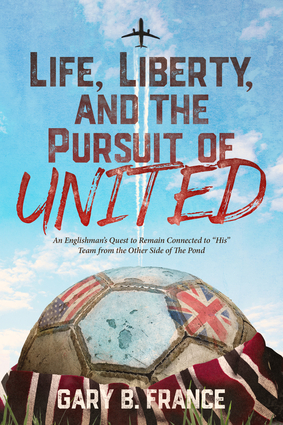 "Life, Liberty, and the Pursuit of United" isn't simply about one man's dedication to soccer and his team. It's about fans and the lengths to which we go to remain connected; it's about home, where it all starts, and remembering those roots no matter how far we wander; and it's about community, characters, and—most importantly—the friendships that evolve through a shared passion for the "beautiful game." Gary B. France has been a Manchester United fanatic for over forty years. He is in the medical field which has provided him the opportunity to help thousands of patients recover from injury. He was previously a radio DJ and hosted a Saturday morning show called The British Invasion. He lives in Alpena, Michigan.